When I first saw the news about Disney/Pixar’s plans to make a movie set in Mexico and based around the Day of the Dead, I was cautiously optimistic. On the one hand, after two too many movies about cars, it was about time they made a movie about at least part of who I am. On the other, I hoped they wouldn’t make a joke or a mockery out of the culture with the movie. I’m happy to say that they didn’t. Coco is a welcome change from most depictions of Mexicans in pop culture. 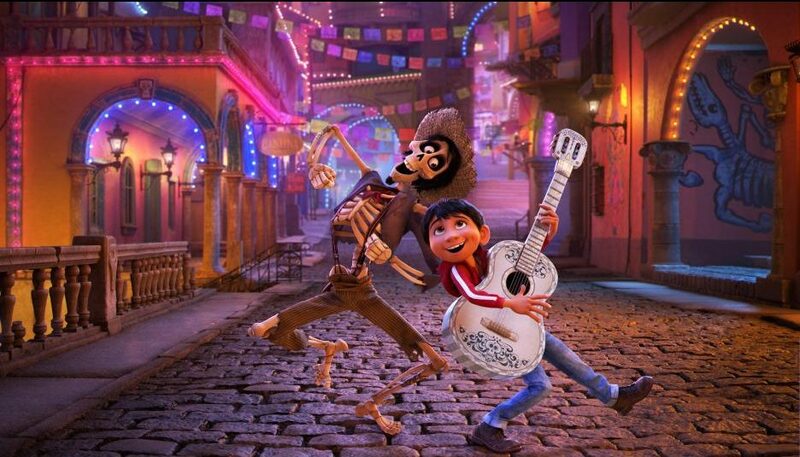 Even though I am only part Mexican, it still made me feel extremely valid from the beginning—the traditional Disney theme has a mariachi-band twist for Coco, which I loved. The movie centers on 12-year-old Miguel Rivera (voiced by a wonderful Anthony Gonzalez) and his family. In the opening sequence—created with papel picado, another Mexican tradition—Miguel explains his dilemma. He loves music and wants to be a musician, while the rest of his family hates music so much that they ban it in all forms. That’s all because of one man: Miguel’s great-great-grandfather and musical hero, Ernesto de la Cruz (Benjamin Bratt). Miguel idolizes him during Día de los Muertos while the rest of his family tries to forget him. Despite the main conflict between him and his family, you can’t help but love Miguel. He’s bright, adventurous, and incredibly stubborn—or determined, depending on how you see it. It was really nice to see a Mexican person at the center of a story, especially one as independent as Miguel. While his family wants him to join the business as a shoemaker, he wants nothing to do with it. The trope of the main character going against their family’s wishes is very common in Disney films, but it takes a different and fresh approach in Coco. After a fight with his family, a chance at a guitar leads Miguel to what’s called the Land of the Dead, where he searches for Ernesto. Coco’s directors, Lee Unkrich and Adrian Molina, took their production team to Mexico for a years-long research project for the look and feel of the film, but the group had to come up with their own version of the afterlife. They did it well, combining the classic Pixar charm (such as vibrant colors on the marigold bridge connecting the living world to the Land of the Dead and the overall attention to detail) with parts of the Mexican culture, including the concept of family. Miguel meets the other members of his family—the dead ones—and their relationships are just as strong as those in the living world. They even offer to send him back to the living world as long as he gives up music. But he doesn’t budge there, either, eventually meeting a new friend named Héctor (Gael García Bernal). Their relationship is an odd one that seems one-sided at times, but I liked it anyway. Miguel and Héctor show the audience that family can come in many forms, even if it’s outside of your blood relatives. Coco continues with the right amount of high points and low points we’ve come to expect from a Disney/Pixar production, including a heartbreaking scene with a fatherlike figure named Chicharrón (Edward James Olmos). Even though Miguel’s stubbornness made me mad at times, I was drawn to him and his adventures as the movie went on. The creators used the right amount of music and Spanish dialogue to keep my attention. However, more than anything I found myself rooting for Miguel to have the happy ending that most main characters get. It takes a lot for me to cry, especially during movies, but Coco was the exception many times over. Some were happier scenes, but many of them were sad. Despite that, I was happy to see that a story about a Mexican boy and his family got the same treatment as, say, Frozen. The crew didn’t sugarcoat Miguel’s story. They also didn’t stamp out the originality of the concept to make it fit the mold of previous Disney/Pixar movies too closely. For example, the music: every part of the music is original and unique, headed by power couple Robert Lopez and Kristen Anderson-Lopez (who also put together the music for Frozen, among other hits). Mexicans, Latinos, and anyone looking for a feel-good story will enjoy Coco. You don’t need to know how to speak Spanish to see it, but there is a bit of 101-level Spanish used and there are no subtitles, so basic familiarity with the language will help. I wouldn’t recommend it for children under six, as some parts of the movie might be too scary. The thing I liked the most about the movie was its authenticity. The crew went above and beyond to make sure they told the story right, and it shows. Also, nearly everyone in the movie’s voice cast is Latino or Latina, which is a wonderful thing. (The exception? Pixar staple John Ratzenberger.) Seeing Coco made me proud to be a Mexican, and I hope others feel the same way. Caissa is a self-made geek in all parts of their life. A librarian in training, they love reading, writing, playing video games, and singing. They also take their coffee cold all year long.